Total length of workers around 2.5 - 3 mm. Body color black to blackish brown. Antennal scapes short, not reaching posterior margin of head. Dorsal outline of mesosoma almost straight in profile. Propodeum with short, triangular spines of variable size. Petiolar node triangular, its dorsal margin angulate in profile. This is an arboreal species, nesting in dead twigs on standing trees. Nuptial flights occur on mid July (Sonobe, 1980). Chromosome number is 2n = 18 (Imai & Kubota, 1972). It is common in Honshu, Shikoku and Kyushu, but rare in Hokkaido. 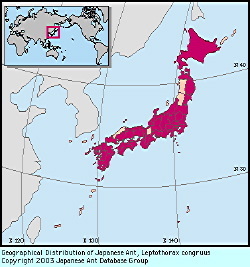 Hokkaido, Honshu, Shikoku, Kyushu; Korean Peninsula. Descriptions of new species of Tenthredinidae, Ichneumonidae, Chrysididae, Formicidae, &c. of Japan. Transactions of the Entomological Society of London (4) 7: 373-409. Onoyama, K. (1980). An introduction to the ant fauna of Japan, with a check list (Hymenoptera, Formicidae). . Kontyu, 48, 193-212. Sonobe, R. (1980a. ). Ants living in gardens (1) - Ants creaping on the ground-. . Insect (Kontyu-Aiko-Kai, Tochigi-ken), 31(1), 1-9. .
Imai, H. T. & M. Kubota (1972). Karyological studies of Japanese ants (Hymenoptera, Formicidae). III. Karyotype of nine species in Ponerinae, Formicinae, and Myrmicinae. Chromosoma, 37, 193-200. Original text by Mamoru Terayama, Keiichi Onoyama, and Masaaki Morisita. English translation by Mamoru Terayama, edited by Robert W. Taylor.